Loughborough University, one of the UK’s leading engineering institutes, is using its recently installed SmartScope Flash 200 video measurement system from OGP to help students, research groups and commercial organisations push the boundaries of non-contact measurement to new levels. With around 130 staff and 1,000 students (150 of which are PhD students), the Wolfson School of Mechanical and Manufacturing Engineering at Loughborough University is one of the biggest departments of its kind in the UK. It has an international reputation for maintaining extensive links with industry and for being at the forefront of technological innovation. In terms of metrology alone, the department has been responsible for many new hardware, process, standards and calibration innovations in recent years. Helping support such an impressive track record is the Wolfson’s extensive metrology equipment portfolio, which includes optical, dimensional, surface texture and pressure-based instrumentation. In terms of dimensional metrology, the introduction of non-contact, video-based measurement has helped complement more conventional, tactile-based co-ordinate measuring machines (CMMs). Initially installing a pre-owned SmartScope FOV, Wolfson has since acquired a brand new SmartScope Flash 200 video measurement system from OGP UK. SmartScope Flash, with more than 2000 systems installed worldwide, is one of the most popular multi-sensor and video measurement systems available. Its compact, robust design meets the measurement needs of manufacturers and laboratories in a broad range of sectors. SmartScope Flash features a high quality 12:1 zoom lens that provides excellent optical performance over its entire range. This patented AccuCentric lens maintains accuracy by calibrating itself automatically with each magnification change, while patented illumination technologies includes a fixed array of LED lights that track the X-axis and provide square on profile lighting, which is crucial for the accurate measurement of thick walled or shaft components. “Aside from student conducting individual projects, we currently have 13 research groups here in the department and they frequently have to measure objects that do not lend themselves to tactile measurement, i.e. they are too thin, fragile, sticky or slippery, hence there is a real need for non-contact measurement,” explains Dr Petzing. Until recently the department had two conventional bridge type CMMs. The original idea was to introduce a camera-system to one of the CMMs but the inherent accuracy levels did not allow this strategy, hence it was decided to replace both with one new CMM and a video-based system. 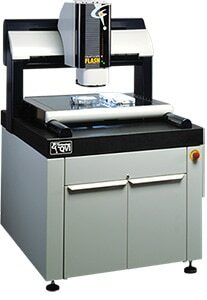 Duly installed in Wolfson’s temperature and humidity controlled metrology lab, the Flash 200 is operated today by three different user groups: undergraduate students at third or fourth year level; research groups; and commercial organisations from industry. Dr Petzing says that vision technology is particularly useful when measuring components such as printed circuit boards, etched glass, biological samples, or where there is a need to avoid contact force, such as in polymer components. Surface illumination on the SmartScope Flash 200 is provided by SmartRing™, OGPs patented vector light that gives total control of lighting angles making it easy to pick out important features for repeatable and accurate optical probing. The unit is supplied with Measure X® metrology software, which provides the user with all the tools needed to make geometric measurements. The software quickly controls all probe changes, while inspection routines are recorded automatically and edited easily using icon driven commands. Data outputs can be customised with reports available in printed or digital formats. As further options for Loughborough University, SmartScope Flash can be fitted with a Renishaw touch probe and a TTL laser probe, thus facilitating the measurement of full 3D geometry and fast accurate surface scanning. In fact, Dr Petzing concedes that multi-transducer technology is high on the agenda at the university, and that Wolfson will be keeping a close eye on technology developments.